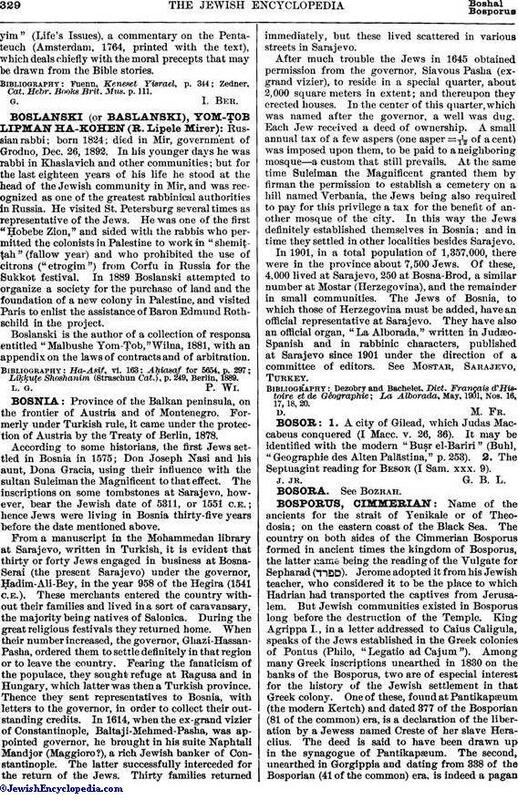 Russian rabbi; born 1824; died in Mir, government of Grodno, Dec. 26, 1892. In his younger days he was rabbi in Khaslavich and other communities; but for the last eighteen years of his life he stood at the head of the Jewish community in Mir, and was recognized as one of the greatest rabbinical authorities in Russia. He visited St. Petersburg several times as representative of the Jews. He was one of the first "Ḥobebe Zion," and sided with the rabbis who permitted the colonists in Palestine to work in "shemiṭṭah" (fallow year) and who prohibited the use of citrons ("etrogim") from Corfu in Russia for the Sukkot festival. In 1889 Boslanski attempted to organize a society for the purchase of land and the foundation of a new colony in Palestine, and visited Paris to enlist the assistance of Baron Edmund Rothschild in the project. Boslanski is the author of a collection of responsa entitled "Malbushe Yom-Ṭob," Wilna, 1881, with an appendix on the laws of contracts and of arbitration. Liḳḳuṭe Shoshanim (Straschun Cat. ), p. 249, Berlin, 1889.